I have worked with product owners & co-founders in small cross-functional teams to create products (called ventures) that engage with users, and convert them into full-fledged banking customers at Royal Bank of Canada. 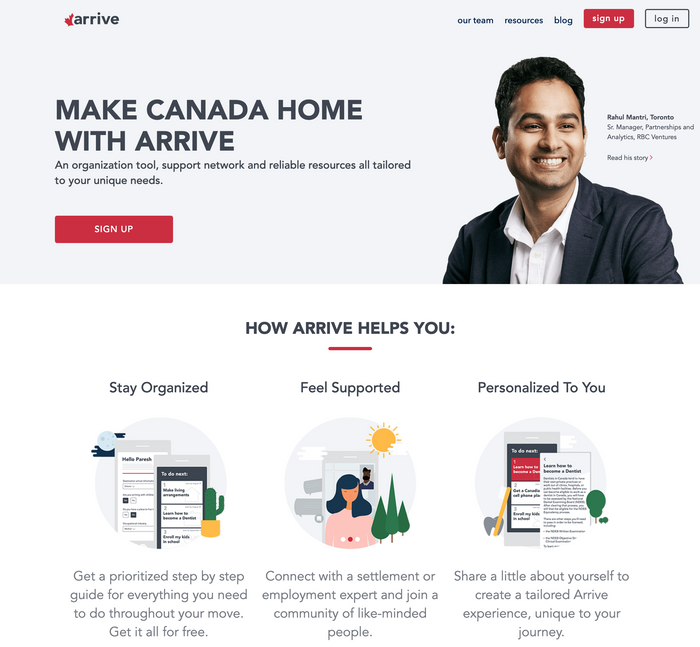 Arrive is a platform helping new Canadians settle into Canada. Joyride is a responsive web app allowing potential car buyers to compare vehicles suitable to their lifestyles. In summer of 2018, a hackathon was held for small teams to build a prototype designed to solve their assigned business case. I was part of a team assigned to develop a prototype that would create organic traffic towards the Joyride website. and redirect users to a Joyride comparison page containing this vehicle. The entire website is fully client-side, with copy content fetched from Contentful. Designed by Night Shift Studio. The website was unveiled at a June 13, 2018 investor event. and the amount of distance driven (kilometers) by their vehicle. A user interested in selling their vehicle would be connected with the product owner.